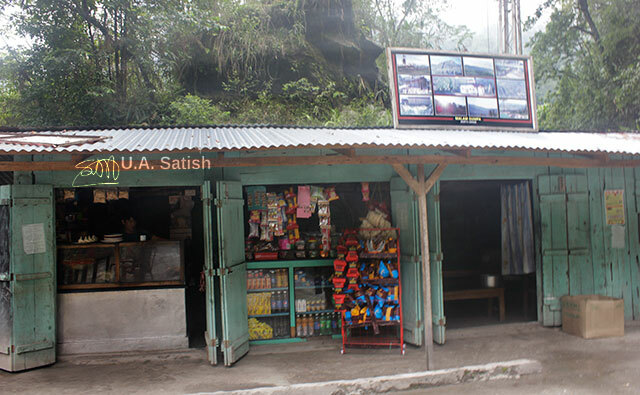 By road to Lachung is 102 km from the state capital Gangtok. The journey takes about 4.5 hours. Most visitors stay overnight at Lachung enroute to the beautiful Yumthang Valley. 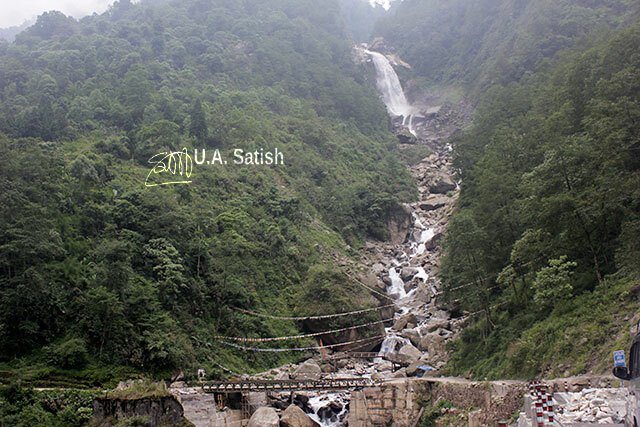 It is a scenic route with charming villages and waterfalls along the way. 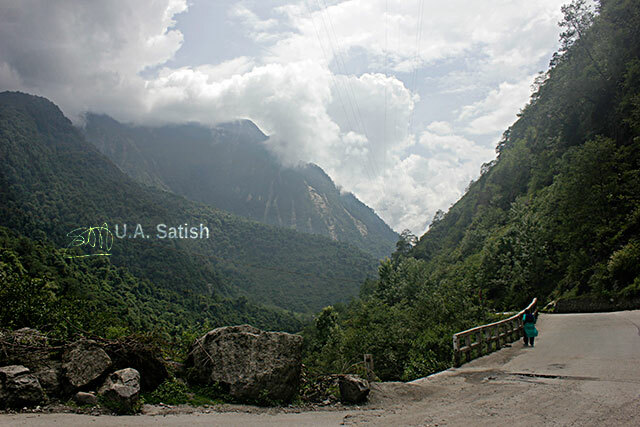 Visitors climb from Gangtok at 5,118 feet to Lachung at 8,610 feet. We travelled in a Tata Sumo driven by a Nepali driver. 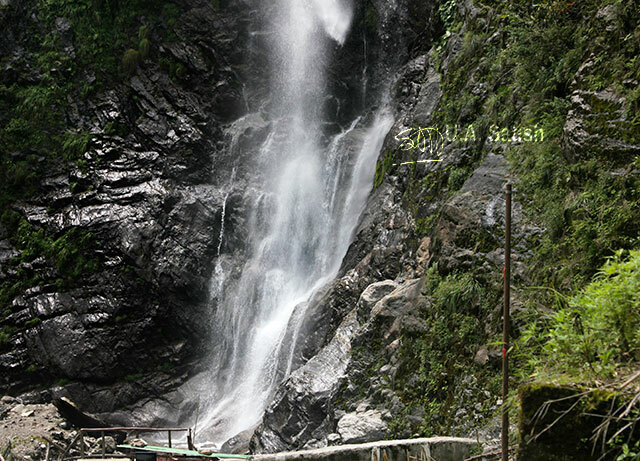 Right by the roadside on the Gangtok – Lachung route is Seven Sisters Waterfalls. It is supposed to have got its name because the fall has seven steps on the way down. I could not make out the seven steps from down below. There is a footbridge across the stream for visitors to get a closer view. A large picture of Budhha overlooks the falls. Cars pass along an old narrow bridge opposite the waterfalls. It is festooned with multi-coloured flags. The waterfall itself is beautiful and very chill. The flow of water reduces during the summer months. We found this stall near Seven Sisters Waterfalls. Hungry travellers could buy momos, samosas and noodles. Biscuits, tea, colas and bottled water were also on offer. Most such shops down their shutters by evening. 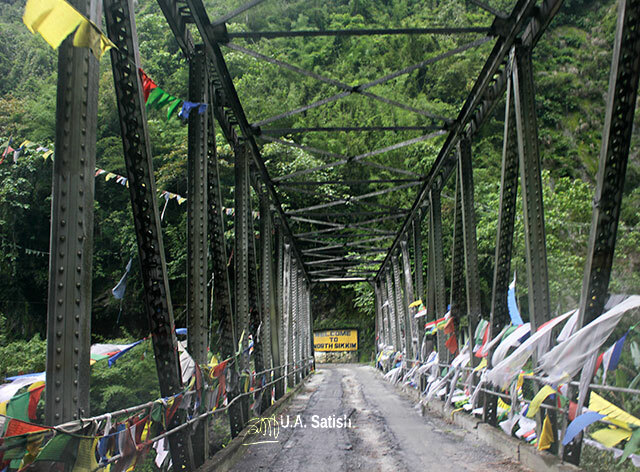 Border Roads Organisation (BRO) built this modern bridge. The local MP inaugurated it in December 2016. BRO is engaged in many road building activities in the border area. 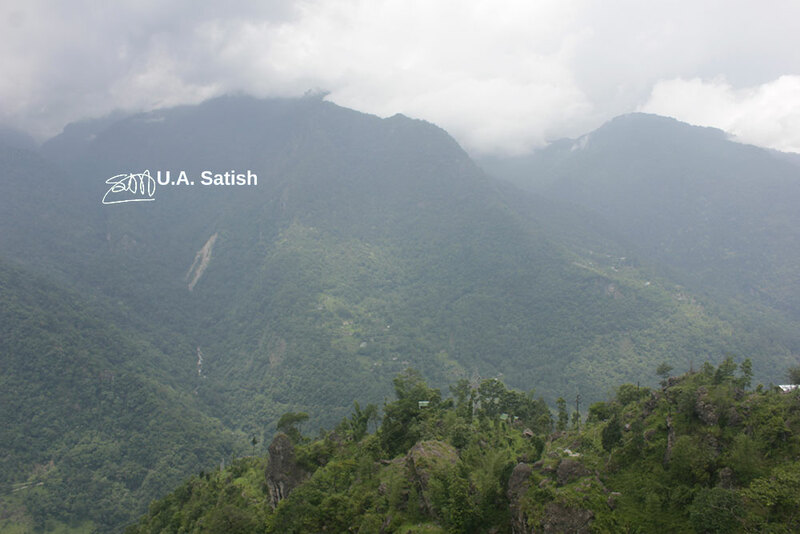 We stopped at Lungma Dara View Point for a sweeping view up, down and across the Himalayan mountains. We were really up among the clouds there. 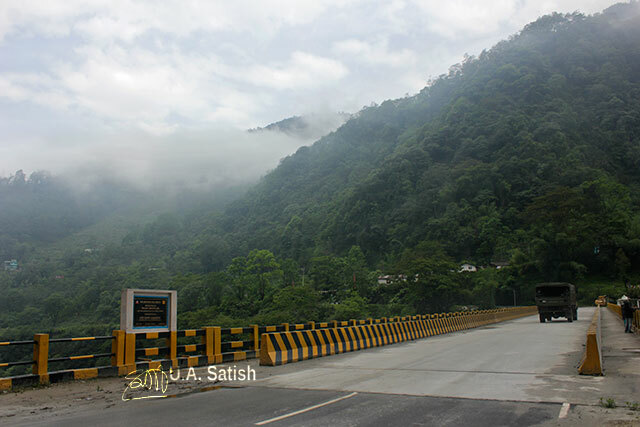 A long descent began as the road swung north out over the very deep valley of the Teesta River. 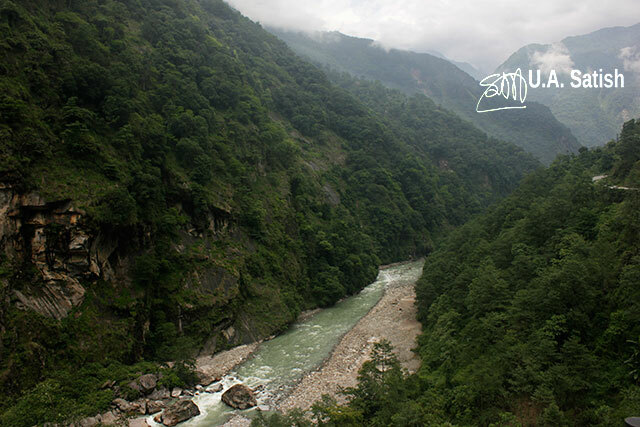 It flows through the length of Sikkim and is regarded as the lifeline of the state. Ae a height of 275 metres is Bhewma Falls. In the local dialect it means Red Snake. 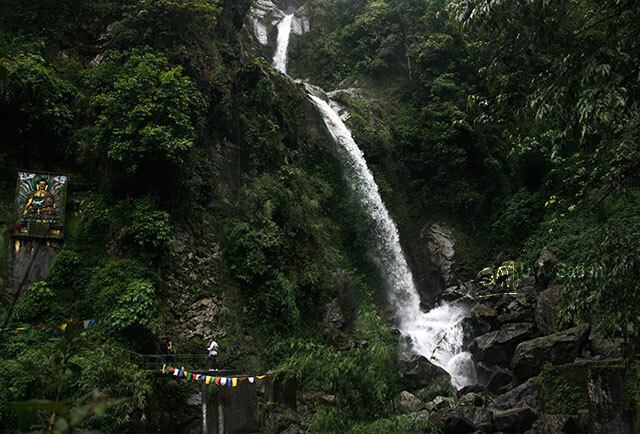 Over the years, tourists have started referring to it also as Lachung Falls. It comes down in three steps. If you liked my post, please feel free to follow me on Instagram, Flickr and Facebook.